Goodness how close are we to Christmas ?!! 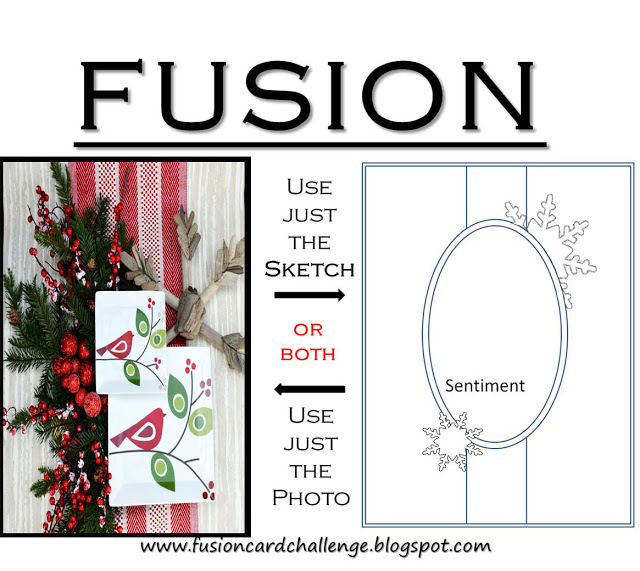 Luckily, to help us with our holiday card needs, we have some lovely inspiration from today's Fusion Challenge! This is also the last challenge of 2015. We'll be back in the New Year and you have until Jan 5, 2016 to link up your creation! I actually did the FUSION this time - being inspired by the photo AND using the sketch - yay for me!! I recently purchased these lovely stamps and coordinating dies from Papertrey Ink - called Spruce and Sprigs and was happy to get to use them on my card today. The sentiment is from another new PTI set called Joyful Christmas. I used oval Nestabilities to cut the background out of this pretty dotted burlap patterned paper and a slightly larger framing out of Scarlet Jewel cardstock. 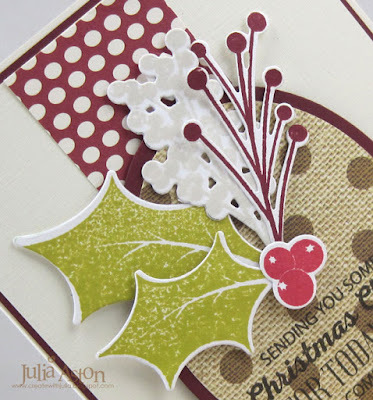 I stamped the sentiment directly onto the paper and layered the die cuts with foam dots. On the inside - I used another sentiment from Joyful Christmas and one of the berry die cuts from Spruce and Sprigs. What inspires you from this weeks Fusion Challenge? 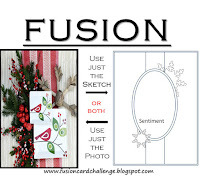 I hope you'll join in and link up your creation over at the Fusion Challenge Blog. You'll also find all of our cards and the challenge details over at the Fusion Blog! Hope to see you linked up there! Winners will be chosen by all of our teammates in two weeks! We each will choose one favourite! The winners will be announced at 4am (PST) in two weeks!! Please check the linky for the days left to play with us! Paper: Vintage Cream Linen Cardstock, Vintage Cream, White, Scarlet Jewel, Textstyle Holiday Cheer - PTI, DP Burlap Polkadots - Michaels. Accessories: Spruce and Sprigs Dies - PTI, oval Nestabilities/Spellbinders, foam dots. Fantastic funky modern card - love its sleek stylish look. 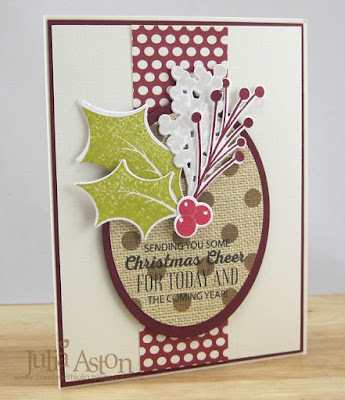 That dotted burlap is a fab bg for your sentiment!! Gorgeous! Fabulous card! Love the holly! Merry Christmas! I love how you stamped the inside too. This is gorgeous Julia! I love this PTI set and can't wait until I can own it myself - every time I go to order it, either the stamps or dies are out of stock. Your card is gorgeous, Julia. The polka dots work so well with the berries.